Fans of Strava on both Android(s goog) and iOS(s aapl) should be happy today as the exercise tracking app got a huge update — Strava 4.0 — on Thursday. The software adds a number of social features, can now track miles on shoes, bicycles or other equipment and paying subscribers gains audio updates at various points during a route segment. While adding the new features, Strava has combined its running and cycling software into a single app with version 4.0; helpful for those that cross-train. And it has made the software useful in more countries, now supporting 11 languages in this version including Dutch, Japanese, Korean, Russian and Traditional Chinese. On the social side, Stava’s new activity feed shows Instagram photos taken during exercise and also has one-touch buttons for sharing activities to Facebook(s fb), Path and Twitter (s twtr). When working out with others, activities are automatically grouped for all involved. Maps of routes will also appear so you can see where your friends are working out. And you can track equpiment used: Since running sneakers start to break down after a certain number of miles, this is a feature I look for in all of my exercise apps. All of these features are included in the free version of Strava, but premium subscribers ($6 a month or $59 a year) gain some extra benefits in the app, such as audio data for a workout segment start, halfway point and finish. The premium subscription also provides detailed historical charts and analysis of your efforts. 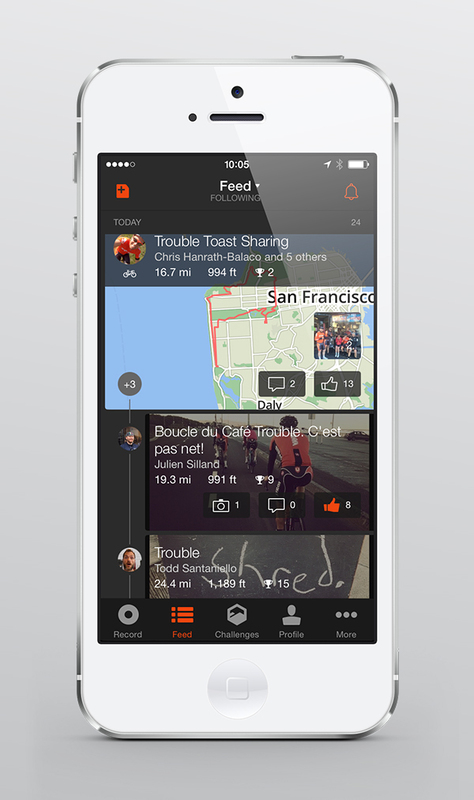 Strava 4.0 is available now in the Google Play Store and the iTunes App Store. This post was updated at 5:50am, 3/14/2014 to correct the features added in the premium version.